What you need to know before sitting down. Offering delicious food at bargain prices, hawker centres are one of our favourite things about Singapore. Here’s everything you need to know before sitting down for a meal at a hawker centre. 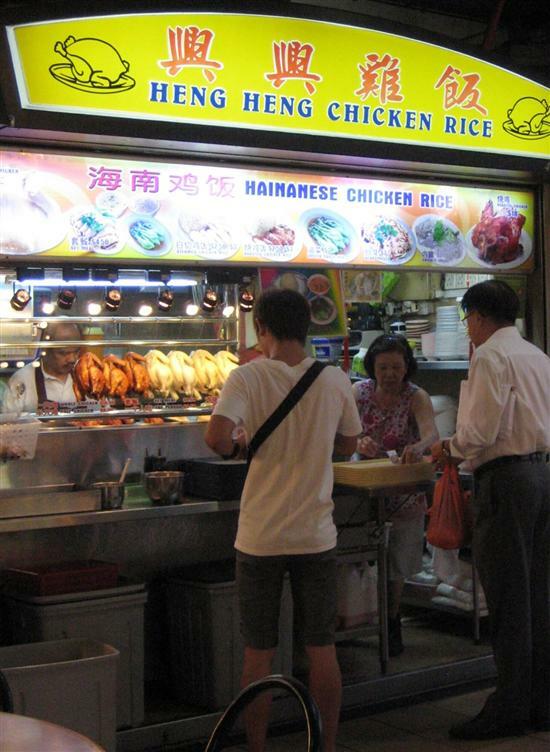 Soon you’ll be ordering chicken rice like a pro. 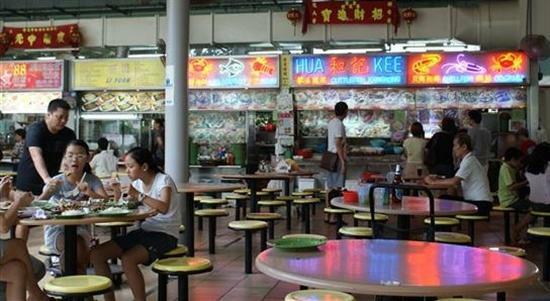 The first things most Singaporeans do when arriving at a hawker centre is find a table. There are no rules about seating and you can sit wherever you like — ignore touts at touristy hawker centres like Newton Circus Food Centre who will try to steer you to a table near their stall. It is common to reserve a table by leaving a personal item on the tabletop, a practice called “choping” in Singlish. The most common item used to chope tables is packets of tissue, but you can also do it with an umbrella, newspaper or any other item you’re not too worried about leaving unattended. When hawker centres are extremely busy, like at lunch time on a work day, it’s common to share a table with strangers. Once you have a table, it’s time to order some hawker food. Most hawker centres have dozens of food stalls and you can order from any stall you like. Each stall will have a sign in English listing what they sell (rarely the sign is only in Mandarin) and it is a legal requirement that the price is clearly displayed. If you see multiple prices for the same item, such as for fried carrot cake, this means it is available in multiple sizes. We’ve never encountered a hawker stall where English was not understood, although sometimes we’ve had to repeat our order several times. A typical hawker centre stall. Try to remember your table number because some hawker stalls will bring the food directly to your table when it’s ready. If the stall has a sign that says “self service” they will not, and you’ll have to wait near the stall until it’s ready. All transactions at hawker centres are in cash (Singapore dollars). The utensils used to eat a hawker meal depend on the ethnicity of the food. Chinese dishes are traditionally eaten with chopsticks, while Malay and Indian dishes are traditionally eaten with your right hand. Of course, forks and spoons are also available. What isn’t provided at hawker centres is paper napkins for wiping your hands and mouth. Singaporeans are accustomed to bringing their own and you’ll often see the elderly or disabled going table to table and selling packets of tissue paper – the going rate is three for S$1. When you’re finished eating, leave your table exactly as it is; there are hawker centre employees who clean up after you. The waste is disposed of and the dishes are washed and reused. In case you drink too much Tiger beer, toilets are available at hawker centres – just be aware they quite basic (i.e. squat toilets) and using them may cost S$0.20.